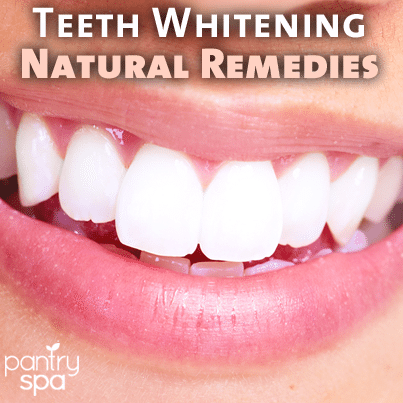 Teeth Whitening Home Remedies That Actually Work! It’s normal to notice some color change in your teeth over time, especially after years of drinks like red wine, tea and coffee. But is there anything you can do to return your teeth to white? If you are nervous about using harsh chemicals, these remedies may work perfectly for you! If you’re trying to stay natural with your teeth whitening plan, try using apples and strawberries. Strawberries: Strawberries naturally have malic acid in them, which is one of the ingredients in whitening toothpastes. Try rubbing strawberries on your teeth, then leave the juice on for a minute before rinsing it off. Strawberries also have fiber that will remove bacteria from your mouth! Apples: Apples are a natural stain remover because they increase saliva production. Dairy Products: Dairy has lactic acid, which helps protect your enamel and prevent gum disease. Adding milk to your coffee will also help decrease stains on your teeth from the coffee! Eating lemons is great for whitening teeth because they cause you to produce more saliva, which will help whiten your teeth. Baking soda is a strong (but safe!) whitening product. However, using them together on your teeth can be too abrasive for your enamel. Once your enamel is gone, it’s gone for good. There is also little evidence that a baking soda and lemon juice paste will whiten teeth. How Often Can You Whiten Your Teeth? If you are using drugstore products or visiting your dentist’s office for whitening, you should not whiten more than twice a year. However, natural whitening remedies like apples and strawberries can be used more frequently. The best way to reduce your need for teeth whitening is to avoid drinks like red wine and coffee. Is It Safe to Whiten Teeth with Lemon Juice and Baking Soda? Baking soda is one of the safest products you can use to whiten your teeth. It’s an acid neutralizer that’s perfect for stain removal. Use baking soda in moderation though – overuse can cause break down the enamel. Twice a month, you should brush with only baking soda.